In the penultimate class of the beginners series we will be exploring forward folds. Seated forward folds can be particularly challenging for beginners because of tight hips, hamstrings and low backs. Here it is important to take the time to execute proper preparatory poses as we did at the beginning of the series to prepare your body so that it is easier for your pelvis to roll over your leg bones. During this class we will spend a lot of time loosening up your hip joints and creating a lot of space in your hip socket so this happens more easily. We will open up the backs of your legs to create length in preparation for your forward folds as well. Patience is extremely important in forward folds. Progress here is usually very slow. 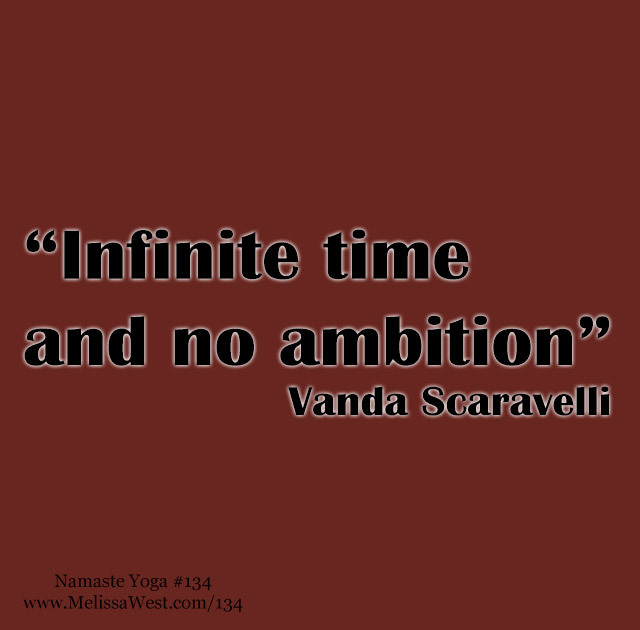 In preparing for this class I finally realized where I got the saying, “Infinite time and no ambition,” apparently it was something Vanda Scaravali said in relation to forward folds! Eventually forward folds can be calming and restorative, but for most people it is an exercise in patience as we learn to surrender into “what is” in our bodies. Props needed 2 block a blanket. Visit www.thankyoumelissa.com to leave your testimonials. Thank you for making us Canada’s Most Popular Free One Hour Online Yoga Show! Props Needed: 2 block a blanket. Today’s question to answer in the comments is: Where in my life can I practice “infinite time and no ambition” or more patience.